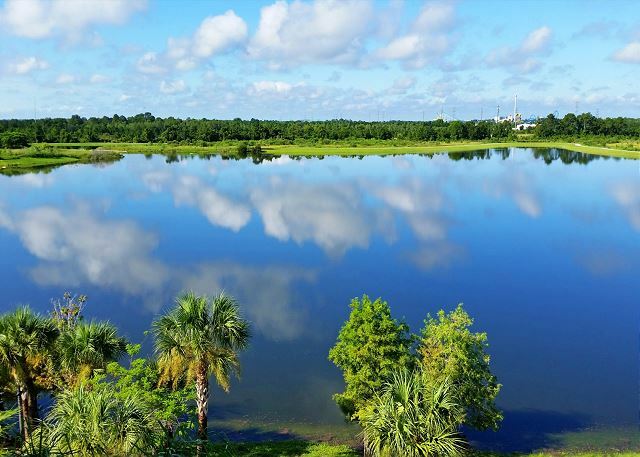 Enjoy the best of what Orlando has to offer and stay centrally located to its top attractions at the beautiful Vista Cay Resort. Florida Palms is a luxury top-floor condo with all the amenities you could ever want in a vacation home. Kick off your flip flops and enjoy the deluxe furniture in the living area, complete with a 42-inch HDTV with DVD player. An elegant formal dining area has a lovely wooden table with seating for six guests, so enjoying meals together is easy and enjoyable. The gourmet kitchen is a cook's dream with stainless steel appliances, granite countertops and a breakfast bar. Sleeping accommodations include a master suite with a king bed, large master bath with soaking tub and walk-in shower and his-and-her sinks. A second bedroom features a queen bed and there are two twin beds in the third bedroom. All bedrooms host their own TV. A queen sofa sleeper in the living area offers room for more guests, allowing the condo to comfortably accommodate 8 guests. The walk out balcony has a spectacular view over the new Orlando Eye. 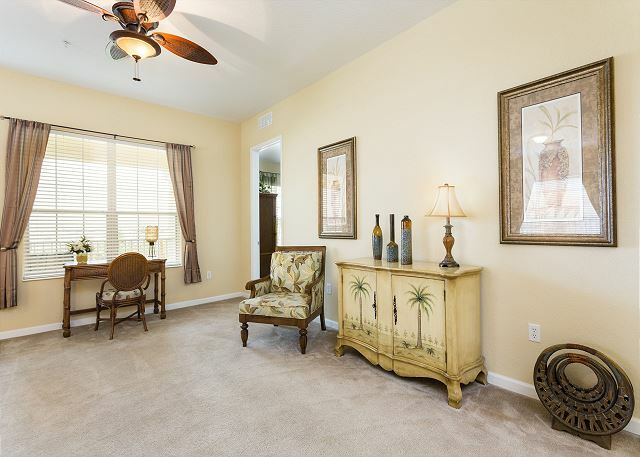 "We hade a nice time in this beautiful condo in Orlando. " "Very nice place. Large accommodations with all the ammenities. Perfectly located for a quick car ride to most of the attractions." "When we enter this home it was everything me and my family was looking for. This home accommodate 9 people and we never felt crowded. This resort was beautiful and we'll keep!! My family enjoy every minute and day we was there. I would recommend this home to anyone that's looking for a place to vacation!! "Usamos poco las instalaciones porque fuimos a los parques básicamente. Pero nos pareció un hermoso lugar"
"Very clean and quiet and just an overall nice place to stay"
"Overall our stay was very nice, the condo was clean, spacious and very convenient. It was, however, very sparsely equipped, and would have been much more comfortable if it had a few things added. Recommended: extra blankets and bedding, plush towels (the ones there were very small and thin), cooking utensils (specifically spatulas), wine opener, hand mixer, plastic dinnerware and glassware and a roasting pan were all items that we needed at some point during our stay. The decor is fine, several artificial flower arrangements that were a little overpowering and seemed useless. It would have also been nice to know that there is limited cable service as I would have brought my AppleTV. " "Experiencia incrível, sensação de estar em casa. Muito agradável o ambiente." "Great getaway with the family to enjoy the Florida Classic. Spacious, clean and convenient to everything. " 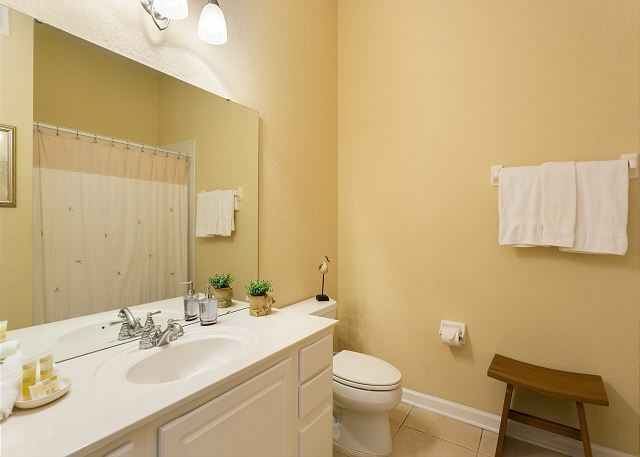 "Casiola vacation home is a very good place to rest in Orlando." "As the title states our condo was beautiful, it was well appointed and convenient to the Orange County Convention Center where our conference was. Everything was "as advertised" - no surprises. " "I booked our condo thinking it would be for a few days for a trade show - but then Hurricane Irma came through and we decided to stay as we thought it would be safer than going home. We are so glad we did! The property was amazing to us and we felt very at home and comfortable. They were accommodating to us with our reservation extension. We will come back for sure!" "Clean, nice pool, updated furniture (not pictured 9/16/2017), new pack and play for baby. Kids loved it and parents were relaxed. We will be back. " 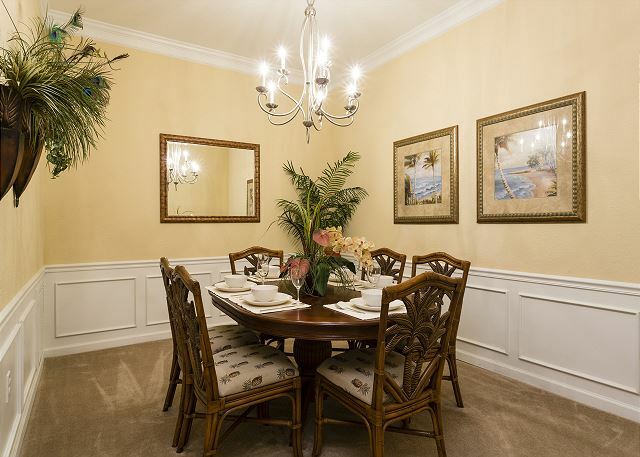 "This was a very nice, spacious condo in Vista Cay. We liked its location within the complex as well. The picture of living room is outdated- now it has nice leather couches in TV area (no carpeting either) and this furniture is in the back living room. I will say it is minimal on supplies- could use more towels, some extra blankets, more glasses- but we managed fine. We had a few things breakdown (disposal, dishwasher & washing machine) and the maintenance crew responded ASAP. That was nice! I would totally stay here again. " "Loved the property in general and the specific Condo. Everything was in good condition and clean. Would have liked more towels for both the bath and the pool, as we were a party of 7 and there was not even 7 towels so we had to keep doing laundry. There were just a couple of issues that should be resolved prior to the next guests stay. 1) the hot/cold water at kitchen sink is hooked up backwards from what you would expect (perhaps a sign or label indicating what direction for hot would help) 2) the TV/stereo system was frustrating. We would continually have to reset the cable box. I 'm not 100%, but I might have diagnosed it by the end of the stay to be caused by an overloaded outlet. There was a gang outlet (maybe 6) plugged into the wall outlet. At various times, one or more of the outlets would not work. We would notice when we tried to plug in a phone charger, etc. but it was not consistent. Sometimes an outlet would have power and sometimes it would not. " "Beautiful 3 BR condo was stayed in. Everything was perfect. The rentals are ideal for families. Restaurants, grocery stores, drugstores, liquor stores, all nearby. Will definitely return. A great value in a high quality setting. Only downside is quality of sheets; they are rough." "We were a group of five women in Orlando for a convention. Vista Cay is very convenient (right next door) to the convention center and it is an easy walk. The condo was beautiful, with plenty of room for everyone and everything. The kitchen is very nice. We also spent plenty of time at the pool, which is very large and very pleasant; lots of lounge chairs"
"The condo was so nice and clean. The mattresses were comfortable and the furnishing were beautiful. We loved our stay. The condo resort was very well kept and quiet. Checking in was made easy. I would highly recommend this property. One of the nicest places I have ever stayed. Very clean and welcoming. " "This condo looked exactly as it was in the pictures! I loved it! Very modern and clean. We were glad it rained so we could enjoy the condo. :) So nice that we didn't want to leave!! " "LUXURY,QUITE , AND SO CLEAN ,GRAET LOCATION,NICE AREA ,CLOSE TO ALL TTRACTIONES ." "Wow what a wonderful place at a great value. this place is spacious and very tastefully done. Would recommend this to anyone. Will be going again." "Enjoyed myself during my stay and my family loved the apartment. will return to the Casiola when we come back to Orlando."